In loving memory of Alfred Ramp. When I found out that Pro Senectute is launching a new campaign to raise awareness about dementia (and all versions of thereof), I knew I had to support it. My grandmother has suffered from dementia for years and my father-in-law, who passed away a few weeks ago, did too. There are 148,000 people in Switzerland that suffer from dementia and oftentimes, they go unnoticed. The older we get the more we become aware of our limits and try to find ways to live longer and healthier. Too often we focus on our bodies and forget the mind. But there is an old saying: “Mind over matter.” It implies that everything in the material world is subjected to the power of the mind. If we put our mind to something, we’ll make it happen. And when our mind is not well, our body won’t flourish either. During the Pro Senectute launch event in Bern, I could see the senior citizens flourish. They were visible… seen. What they’re doing was recognized and given a meaning. It was fun morning learning to knit from them and touching to discover why they decided to support the campaign. For example, one of the ladies traveled all the way from St. Gallen to participate in the launch event, another one had brought around 300 coffee cup sleeves that she had already knitted herself in preparation for this day. How can you join the “Knitting Against Forgetting” campaign? 2. 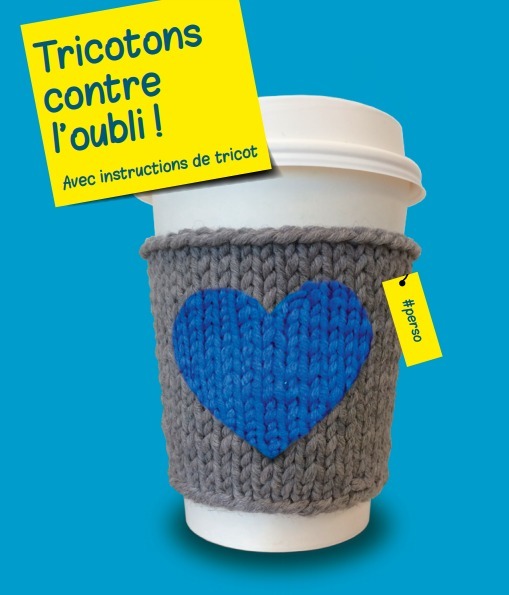 As of 22 January 2019, you can purchase a takeaway coffee in a boulangerie or a candy shop in Switzerland and receive a knitted coffee cup sleeve together with an information leaflet about dementia. La Suisse compte plus de 148 000 personnes atteintes de démence, une réalité qui passe souvent inaperçue au quotidien. Ensemble, tricotons contre l’oubli. Tricotez vous aussi! 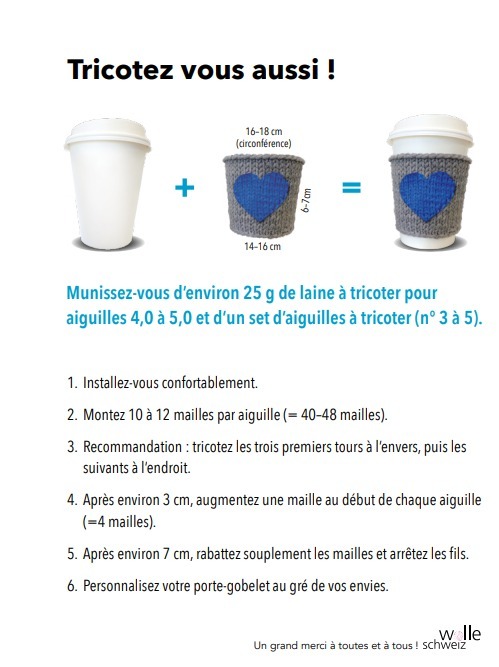 Munissez-vous d’environ 25 g de laine à tricoter pour aiguilles 4,0 à 5,0 et d’un set d’aiguilles à tricoter (n° 3 à 5). Montez 10 à 12 mailles par aiguille (= 40-48 mailles). Recommandation : tricotez les trois premiers tours à l’envers, puis les suivants à l’endroit. Après environ 3 cm, augmentez une maille au début de chaque aiguille (=4 mailles). Personnalisez votre porte-gobelet au gré de vos envies. Vos porte-gobelets seront disponibles à partir du 22 janvier 2019 pour une courte période dans des boulangeries et confiseries aux quatre coins de la Suisse. In der Schweiz leben über 148’000 Menschen mit Demenz – im Alltag oftmals unsichtbar. Gemeinsam stricken wir gegen das Vergessen. Stricken auch Sie mit! Sie brauchen circa 25g Strickgarn in Stärke 4,0 bis 5,0 und ein Stricknadelspiel Nr. 3-5. Schlagen Sie pro Nadel 10 – 12 Maschen an (=40-48 Maschen). Empfehlung: Stricken Sie die ersten drei Runden links und danach alles rechts. Nach circa 3 cm nehmen Sie am Anfang jeder Nadel eine Masche auf (=4 Maschen). Nach circa 7 cm ketten Sie locker ab und vernähen die Fäden. Dekorieren Sie nach Lust und Laune Ihren persönlichen Cupholder. Ihre persönlichen Cupholder werden ab dem 22. Januar 2019 für kurze Zeit in Bäckereien und Confiserien in der ganzen Schweiz erhältlich sein. In Svizzera vivono più di 148’000 persone affette da demenza – sovente invisibili nel quotidiano. Sferruzziamo insieme contro la smemoratezza. Partecipate anche voi! Procuratevi circa 25 g di lana, finezza da 4,0 a 5,0 e dei ferri da 3 – 5. Avviate 10 – 12 maglie per ogni ferro (=40–48 maglie). Fate la prima riga di maglie a rovescio e dopo il resto diritto. Consigliamo di fare le prime tre righe di maglia a rovescio e dopo il resto tutto diritto. Raggiunti i 7cm eseguite un intreccio semplice e ricucite chiudendo le maglie. Decorate a piacere la vostra fascetta personale. Dal 22 gennaio 2019 le vostre fascette saranno disponibili per un breve periodo nelle panetterie e pasticcerie di tutta la Svizzera. Grazie di cuore per il vostro lavoro a maglia! What's Your Biggest Beauty Secret? Sheet masks! Next PostNext What’s Your Biggest Beauty Secret? Sheet masks! This look so much fun. And what a great idea! This is such a great idea and cause! It holds close to my heart since my grandpa had Alzheimer’s!